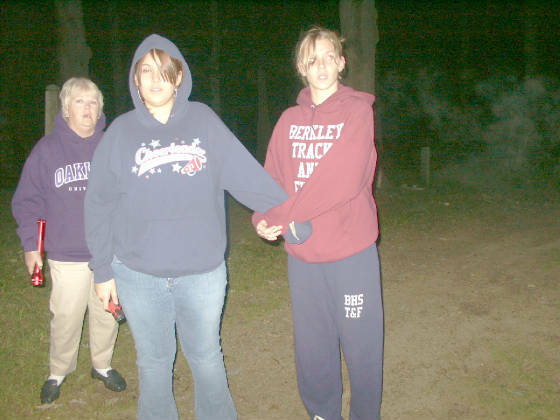 This image above is of several of our investigators just after a team meber felt like she had been forcibly pushed. There was no one standing next to her when this occurred. 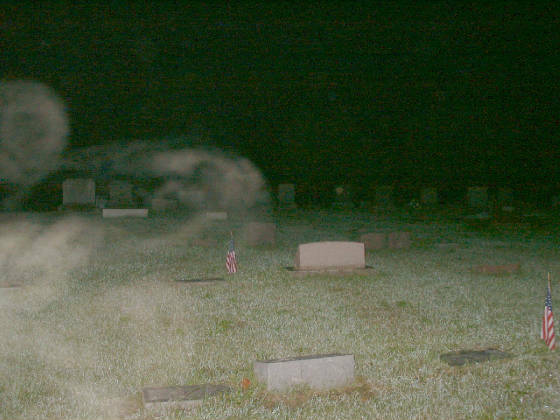 This was in the same area as the mist photos were discovered later. The above two photos are of a back corner where no mist was seen with the naked eye. When we took these photos, several (most) of the ones we took were completely fine and clear, and then this one in the middle had "mist" in it. The image above is the same picture image, cropped and slightly lightened. Some say they see an image in the shadow on the left. This a photo of our FOG members (and nieces!) 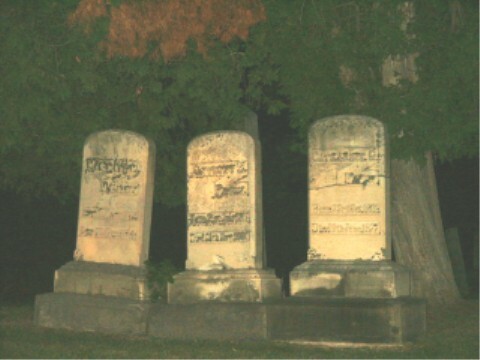 in the same area of the cemetery. 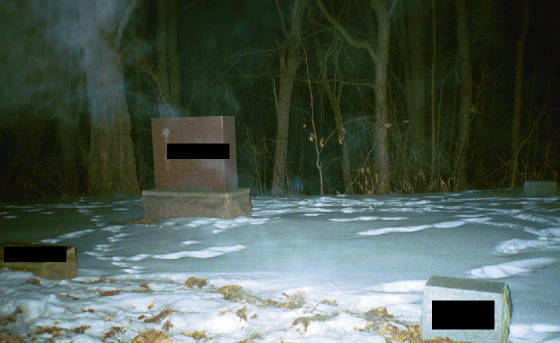 They "felt" like they were being followed, and after the photos were reviewed you can distinctly see a greenish mist behind them in several of these photos from this location. 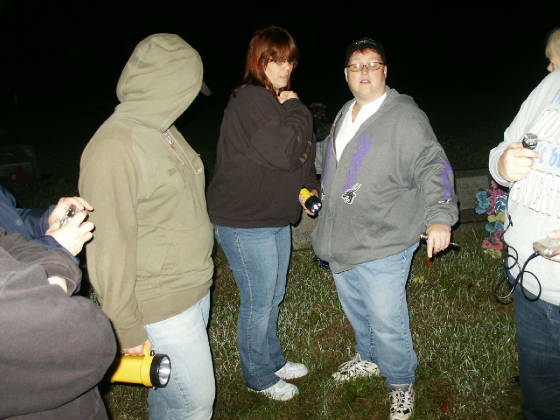 This is the only place anyone "felt" any activity in the cemetery, and unbeknownst to them, it is where stories of unexplained or "ghostly or haunted" phenomena have been reported. 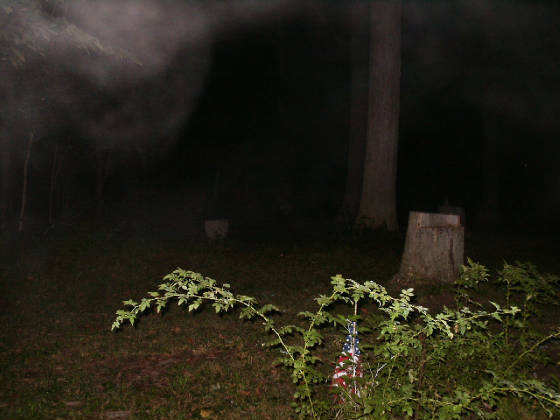 To the left is a very unusual mist photo, taken near the same area but out into the open instead of towards a wooded area. Some of our FOG members were concerned that this photo represented something unpleasant. So far, we must still just call it "unexplained phenomenon" until we get further documentation. What do you think? Email us or sign our guestbook and let us know! 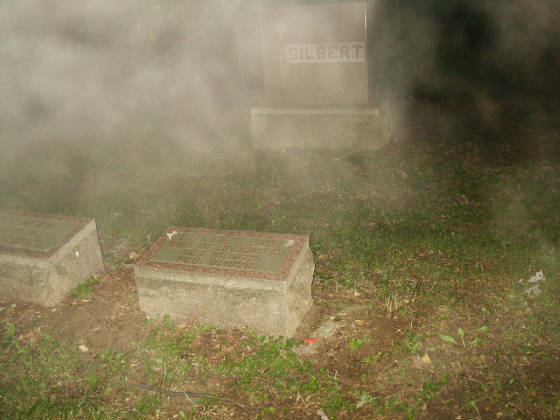 This "mist" was not seen with the naked eye, but it does show up in the same area of the cemetery where "feelings" are felt and and other unexplanable oddities occur. It is reported in the same area almost every time we investigate, no matter the time, temperature or season. We have researched the possibility of plant growth or fungus that may produce a mist, the possibility of decay or other mold type substances, and just about every other logical explanation we can come up with. So far, its just an usual phenomena with an urban legend attached. We are waiting for EVPs that are distinct enough to report, a full body apparition, or some other circumstantial evidence to back up the paranormal possibility. This is the same area in winter. Still got a mist, and this mist looks roughly the same as the mist in summer, spring and fall. We did experiment with mist from steam and from our breath. this seems to us to be different. The photo to the right is one of our favorites, and brings back lots of memories for the founders. The photo to the far right is a cropped and enlarged image of one area of the photo. 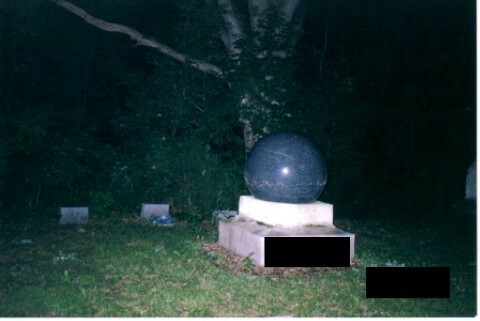 (center of the frame, just to the left side of round marble tombstone in the wooded area.) This photo and others were scanned from a 35 mm photo (in 2004!) and the quality is not great after scanning, but the photo had many unusual characteristics and was from our very first visit here.